Very rarely is creation all fun. When shooting a film, you need to do multiple takes. When writing a book, you need to do edits. When designing a game, you need to squash bugs. This has been a major part of our week, and when I look at our progress board on Trello, I still see all the cards that represent bugs … but they’re nearly all stacked away in our “In Review” category while only two remain to be taken care of. That’s fantastic! More than that, it’s important because a lot of them are related to UI, and that’s a major focus of development for us this week. 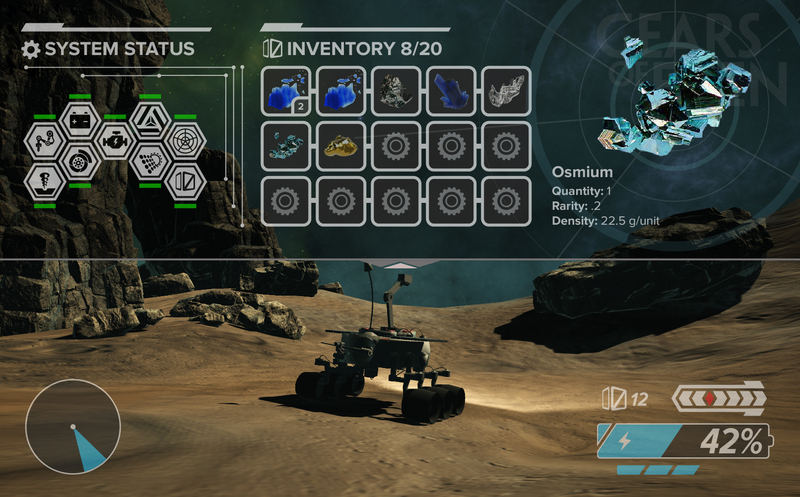 Above, you can see the current state of our Inventory UI, which has come a long way from the static, white screen with colored boxes that it used to be. Getting this piece of the UI clean and in a shape that we’re comfortable with is a major step towards a gameplay experience that is unobstructed and easily managed for the player. Plus, it’s just starting to look pretty cool! At the same time as game development has been going on, we’ve also been working towards community development, with the introduction of our weekly Fan Feedback polls on Twitter. This is where we give you an opportunity to talk to us and tell us what you hope for from Gears of Eden. Check out our first poll results here, and let us know if you agree or disagree in the comments! Get involved! We want to hear from you and we want to make a game that you will love! Thank you as always for taking the time out of your week to read our Dev Update! If you want to keep in touch with the latest Gears of Eden news, be sure to follow us on Facebook or Twitter. Or, if you’re so inclined, sign up for our newsletter for a chance to win alpha keys to the game! We’ll be back next week with a new update, but until then, thank you again for all your support!